I've slowly realized how desensitized I have become to our situation. With Evanna being in the ICU for so long, I've grown increasingly use to it, and it has totally become our new normal. I believe it has become a coping mechanism to protect myself from a complete meltdown and mental breaking point. I've created a daily routine that I stick to, and have little things I do everyday to keep my sanity (ie. Dinner at the RMH, evening trips to either David's Tea or Starbucks, etc). However, in an instant (like Evanna having a particular test or procedure or someone comments on something), I am reminded that what we're going through isn't normal and it can leave me sad and crying for hours. Friday night/Saturday morning was one of those moments. Just after I blogged at how well Evanna was doing, she started to take a turn. Finally I left for the night, but before I did, our night nurse commented that she doesn't know how parents do this, especially for an extended amount of time. I'm not saying she said anything wrong or inappropriate, but it got my wheels turning and kind of popped me out of the autopilot I've been in for the past few weeks. I was still in a little bit of a slump the next morning, and so the fact that Evanna was having a terrible day made for a stressful and bad day overall. She had a really high heart rate and temperature, and was really miserable. 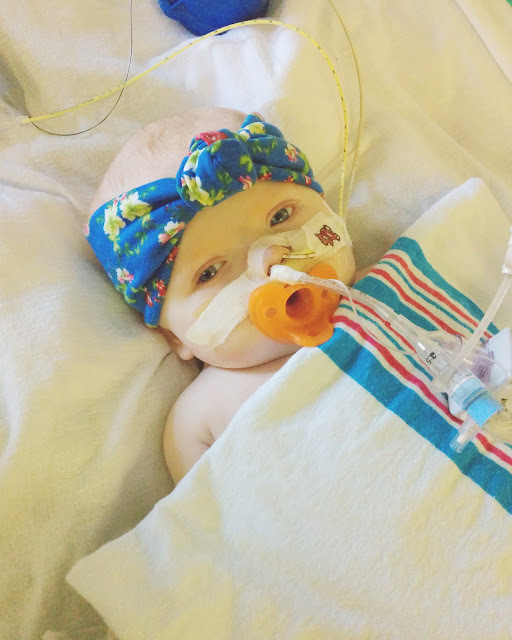 They kept having to give her additional drugs (PRNs) to keep her comfortable and sleepy, because if she was awake, her heart rate and temperature would go even higher and she would drop her O2 levels significantly. The RTs were constantly having to come over to bag and suction her, which meant they were touching her ET tube (breathing tube), which would make her even madder. The final straw for me that day was while I was having lunch, they started a blood transfusion and the nurse got blood on her custom "Evanna" blanket and she let the blood set it. Normally when they give Evanna transfusions, I'm there and make sure to clear her bed of personal items, as transfusions can be a little messy. I came back with the other nurses frantically trying to get the blood out with no success. I grabbed the blanket and decided that it was time for me take a time out and leave the hospital. I took it to the dry cleaners, but major tears were involved while driving there and dropping it off (I'm sure I was a site to see inside the store lol), but I'm hopeful they will be able to get the stains out. I decided to take my time going back to thoe hospital, ate dinner, watched a TV show and grabbed my favourite drink at David's Tea. I went back to the hospital in a much better mood, and Evanna was starting to improve. They had taken cultures earlier that day, and it looks like Evanna had gotten pneumonia, which would explain why she was so sick and needed so much more ventilator support. She had an excellent night on Saturday, and I came back in on Sunday to a whole new baby. She was awake, looking around and pretty much back to her baseline all morning long. They had to change out her NJ tube (feeding tube) twice, and put in a new central line yesterday, as they kept loosing IV access, so they had to sedate and increase her PRNs yesterday afternoon. Today I was told she had another really good night and she's been having a good day. Dr. Rebeyka is back, and so they're is lots of talk between ENT and cardiology on the next step. Obviously Evanna's not-so-calm weekend meant they couldn't extubate her today, but cardiology would still eventually like to try. ENT, however really thinks we need to proceed with an aortapexy as they feel there is still too much compression on her trachea. I can definitely appreciate both sides of the argument. Was last weeks surgery enough to make an extubation successful? Or should we just do everything we possibly can before we put Evanna through an extubation. They've decided to get a second ENT consult, so Evanna went for another rigid bronchoscopy today. At this point we're STILL waiting to hear back from ENT and their findings, but I'll be sure to update everyone when I know the plan. I want to thank everyone on Facebook and Instagram for their music input. Music can be very powerful and healing on some days, so I love when I find an awesome new song.